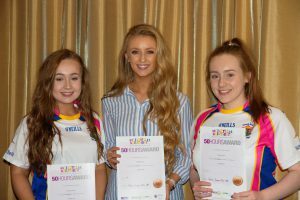 St. Brigid’s is delighted to have 4 club representatives receiving their 50+ hours volunteering certificate at the Wellington Hotel on Monday evening, as part of the Goldmark programme. 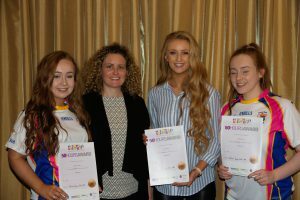 There were over 150 young people who volunteered across the GAA, Ulster Rugby and IFA who gave back their time to their local clubs in various ways such as coaching, administratively, fundraising and social and cultural activities and summer camps etc. 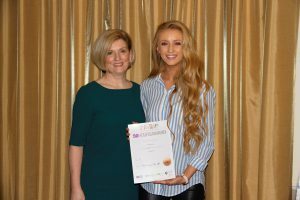 The Goldmark programme works on three tiers; 50+, 100+ and 200+ hours of volunteering service and it is supported by the Department of Education. 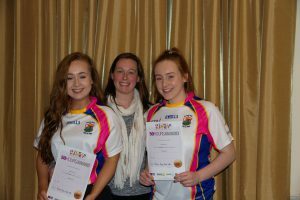 The programme recognises the efforts of young people and their valuable contribution to their club and community. We are very proud of our 4 young volunteers and hope to build on this success well into the future. 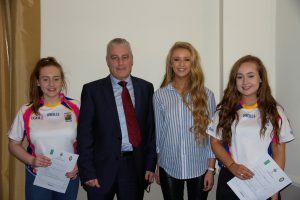 So well done to Molly, Becca, Méabh and Stephen. If any young person is interested in taking part in the Goldmark programme, please contact: tracygalvin77@gmail.com for further information.